Review Context: I have played DuckTales and the underrated DuckTales 2 on NES. I Even played the GameBoy version of DuckTales 2. My experience with the game is memorable. When I was young, I had the privilege of renting a game for the NES. The first game I saw was DuckTales. With the awesome cover art and enjoying the tv series, I told my mom this is the game. I played it and was stunned at how fun the gameplay was. In short, this is the first game I played for the NES followed by Super Mario Bros. I’ll always have a soft spot for this game since this was the game that got me into the world of video games. Ask most people my age about DuckTales and you’ll get different responses. For me the TV series is in my top 5 of my favorite Disney animated series. Most people have this game in their best NES game lists. Staying close to the source material (TV series) though Scrooge’s outfit is a callback to the Carl Banks comics. The many uses of his cane and the outright difficulty of the game stand out, but what stands out the most is the soundtrack. I lost count of how many times I’ve heard people do remixes of the moon level of the game. 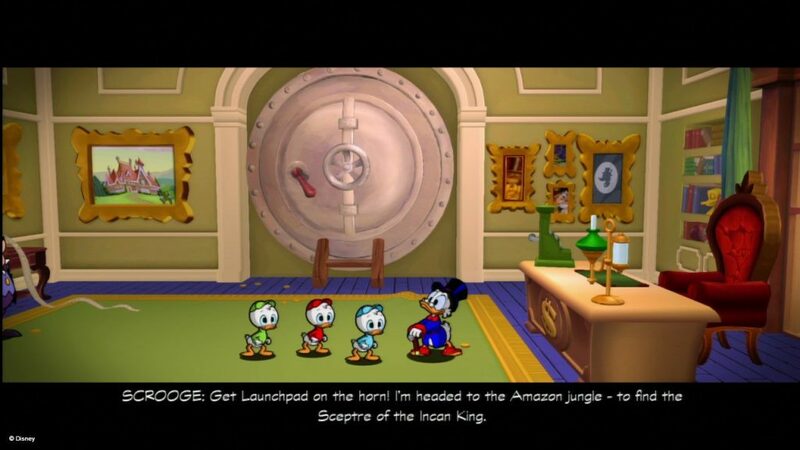 DuckTales in gaming is right up there with Mario. The chances of a remake seemed impossible due to Capcom and Disney staying quiet for all these years. So when the trailer was shown at the Penny Arcade Expo in early 2013, I was beyond excited. After learning that WayForward was making the game, my hopes for the game were set at the highest bar. 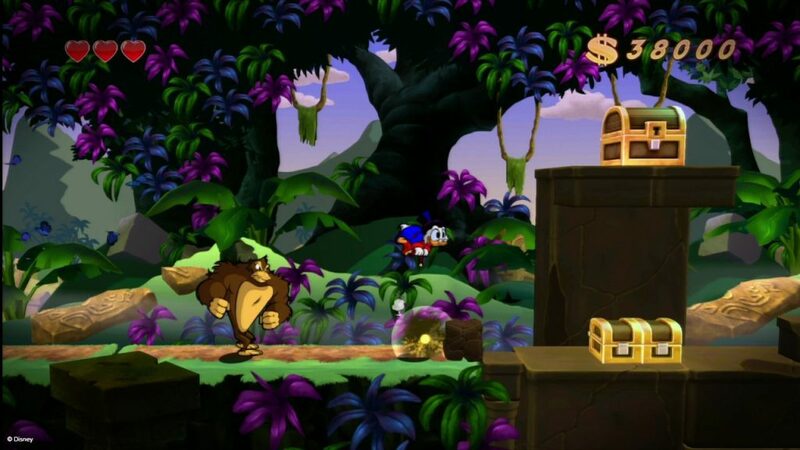 Will DuckTales: Remastered become a found treasure we keep in our money bin? Or will the remake make our life like a hurricane to forget it existed? The reason I give WayForward a lot of respect is that they have former animation crew working with them (they even hired animators from the tv series). The game has the very bright crisp feel of the tv series. It’s very nice to see traditional animation done to this game with the respect and care. One of the things I noticed on the title screen is that LaunchPad’s copper flies in the same direction as the opening to the tv series. That is dedication. I must say that the game does use 3D environments, but it does blend well with the high-definition 2D sprites. Since this is a remake of the NES game the controller only has two buttons so the remake stayed true to the control scheme somewhat. You have jump and attack, but they added a “hard pogo” option. Hard pogo is after you jump you hold down on the d-pad to perform the pogo jump. By default they went with the scheme from DuckTales 2 in which you press attack after you jump. There are parts in the game where you have to climb up objects by pressing up on the d-pad. My biggest grip is the climbing scheme. I’ve had more trouble climbing on the remake then on the original. It became so frustrating I had to take a break from the game. Since I’m playing the Wii U version, I wanted to see how the gamepad would work. The only feature the screen is used for (other than off TV play) is having the map on the screen to keep the main game hub free. You can also use the pro controller. One of the main changes for today’s audience has you going to the Money Bin to stop the Beagle Boys from stealing your fortune. This is mainly a tutorial level to get you use to the control scheme. Once that is out of the way you can play different levels at your pace, (like Mega Man since the original was made by the same people). To keep it fresh, new levels were added and some changes were made to limit the amount of backtracking the NES game had. Once you beat the game, you can upload your completion time to the leaderboard and during breaks between levels you can dive in Scrooge’s money bin. The other new feature is unlocking bonus items, but to unlock the good stuff like the NES soundtrack and artwork from the tv series you have to unlock items you might not care for which is a huge downer. The levels themselves are very bright and colorful which makes the different themes of the level come to life. As for the difficulty, you can change the spike if it’s too hard but changes are made. If you have the challenge on high you have two life bars and limit amount of 1ups and health items while current gives you three and easy gives you five. If you get a game over you must start back at the beginning though you continue on a checkpoint with your lives. The boss battles have been changed to make them more challenging by making you think you have the pattern down until they switch it up at the last second. Another reason for me being thankful WayForward got the job of making the remake is they took into consideration a lot of fans hopes that the soundtrack could match the masterpiece of the NES game. My opinion, they exceeded that. Not only was the soundtrack great, but they gave the game the feel of it being an episode of the series by having most of the original voice actors reprising their roles including Alan Young (Scrooge McDuck) who is in his 90s. Thanks to added dialogue, WayForward thought it would be interesting to explain things in logic, like how is Scrooge able to breathe in space? I always thought because of video game logic, but it’s nice they tried to explain certain themes of logic on some levels. Little nods can also be noticed by die-hard fans, like during the Capcom opening you hear the version used during the 16-bit days. Using parts of the NES tune theme remixed, I found myself leaving the game on the title screen for ten minutes.